Every now and then new churches spring up with new teachings and funny interpretation of the holy scriptures. One of such new churches is the Gabola Church of International Ministries in Johannesburg, South Africa. 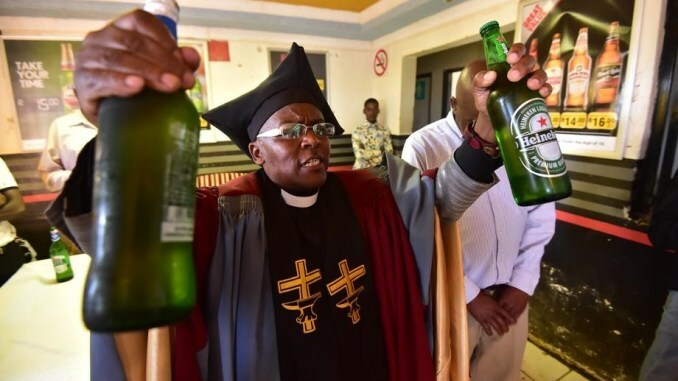 The church, a fast growing Pentecostal church has introduced a new dimension to christianity as it allows the consumption of alcohol during service. Founded two months ago by 52-year-old Bishop Tsietsi Makiti, the church which operate in a tavern now has a congregation of over 500. According to the Bishop, there are plans to open more branches in different parts of the globe to make it an international church. The Gabola Church members drink together during church services and members are baptised with their choice of alcohol. According to the founder, drinking alcohol is not sinful as Jesus changed water into wine in the bible, an action and opinion that has angered many members of Christendom. Freddy Mathebula, the owner of the tavern has however lauded the move saying it has reduced the level of crimes in the area.